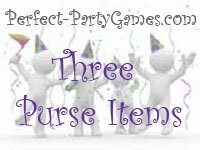 Summary: Three Purse Items is a guessing game played with the contents of your friends purses. Hand out a paper lunch sack to each player. Have them secretly put three items from their handbag into the sack and roll down the top to close. Place all the filled bags in one spot. The Hostess randomly chooses one bag, writes a number on it, then opens the bag and reveals the contents to all the players. The players then write the number of the bag on their paper and a name of the player they believe owns the contents. Do this until all the bags have been numbered and opened. The winner is the player with the most correct answers.